Centralized Mail Delivery-A form of mail delivery system where a letter carrier provides delivery and collection services to a number of residences from a central location. whether in a single-family subdivision or multi-family structure. Business customers also receive delivery services from a convenient central location. 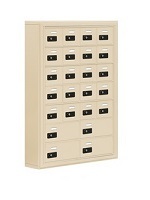 Centralized mail delivery equipment can be in the form of any "clustered" type mailbox – including free-standing, pedestal-mounted cluster box unit, or other cluster mailboxes. The U.S. Postal Service recommends centralized mail delivery systems due to their efficiency. Centralized mailboxes keep the cost of mail service affordable and are becoming common in all new building developments. Cluster Box Units -Referred to as (CBU) and are commonly used in subdivisions, apartment and condominium buildings. Cluster box units are free-standing and are installed in a central location for convenient accessibility for tenants and postal workers. 4C Horizontal Mailboxes- 4C horizontal mailboxes are a commercial mailbox style ideal for apartments, condominiums, office buildings, military bases and new residential developments. 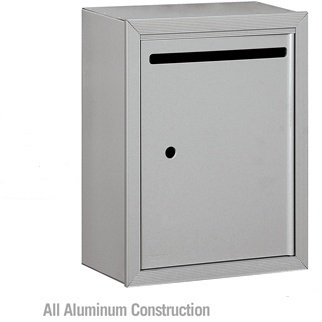 4C horizontal mailboxes are made entirely of aluminum are USPS approved. USA Building Supplies offers 4C horizontal mailboxes in front loading units or rear loading units. USPS Approved Commercial Mailboxes-Commercial mailboxes must meet regulations and requirements as specified by USPS policies. This includes mailboxes with in-coming mail openings and the retrieval of out-going mail. The opening style, design and size are determined by USPS specifications and the USPS carrier must be able to deposit the customer’s mail. Out-going mail designs have limitations due to heightened USPS mail security requirements. Mailboxes must be capable of passing the applicable testing requirements and not made of transparent, toxic, or flammable materials. Commercial mailboxes must protect mail from wet weather conditions and advertising on a mailbox is prohibited. USA Building Supplies highly recommends contacting your local USPS for details regarding their requirements. Letter Drop Boxes-A letter drop box can come in a variety of styles and sizes. Letter drop boxes are designed as a receptacle for receiving outgoing mail. Letter drop boxes are available in surface or recess mounted. TekStak Laptop Lockers-TekStak laptop lockers are extremely versatile and custom fit to your building’s specifics needs. Each laptop has its own compartment optimizing individual security. TekStak laptop lockers come equipped with two locking options; electronic or keyed compartments, electrical outlets and holes for data cables. Key control cabinets- If your main focus is control of valuable assets; you need a key control cabinet. USA Building Supplies product line is the result of our commitment to excellence. Whatever your facility's security requirements are USA Building Supply has what you need. We can secure your peace of mind. Anti-Fatigue mats-Anti-Fatigue mats are designed to reduce stress on the feet or legs with long periods of standing. The mats are designed to reduce fatigue which is caused from standing for long period of time on a hard surface. Fatigue-reducing mats can be made of various materials including rubber, carpeting and vinyl. Number slot - This is a type of door identification used on our horizontal mailboxes and cell phone lockers. This type of door identification is an indentation on an individual door that holds a card to identify a particular compartment. Arrow lock - This is the master lock that the U.S. Postal Service installs on centralized delivery mailboxes that they service. This allows the USPS to access all of the compartments of the cluster mailbox at one time, so they can deliver the mail quickly. Dyna-Shield - This is a process that creates a durable protective barrier on the surface of select foam anti-fatigue mats. Dyna-shield anti-fatigue mats are more wear resistant than standard foam matting. Captive lock - This lock is exclusively used on parcel lockers for commercial mailboxes. A captive lock retains the key when the tenant inserts the key into the lock of a parcel locker door to retrieve a package. The USPS carrier will release this key with their master key the next time he services the cluster box and put the captive key back into the system. Decalon - This is a fiber used in our entrance mats that is made with a much higher denier polypropylene yarn. Floor mats manufactured with Decalon offer excellent wear resitance, great moisture retention, and a sharp, clean pattern appearance. Anti-fish Plate - Installed on the rear of the mail slot of 4C mailboxes and cluster box units to prevent tampering of the outgoing mail and postal access door. Resetttable Combination Locks - This lock is used on our cell phone lockers and can be set to a fixed combination or a combination that can be rest after each use. The resettable combination lock can be accessed with a master control key. Contact Your Only Building Supply Source for information on our commercial mailboxes, drop boxes, fire protection products, anti-fatigue mats, restroom accessories and storage solutions for eletronic devices CALL 1.855-373-5381.